You can’t really claim to have been to Ibiza unless you’ve spent some time in the capital – Ibiza Town. As well as being the largest city on the island, Ibiza Town is well known as one of the best party locations in Ibiza as it is home to legendary clubs like Pacha as well as a huge number of bars, pubs and restaurants. It also has some of the most luxurious hotels and the best boutiques and is a great place for some celeb spotting. By day, the city is a network of streets filled with shops and cafes, perfect for browsing with a coffee to pick out the perfect outfit for Pacha, scouting the best bars to kick off your evening out with style or going retro and getting some post cards to send home. 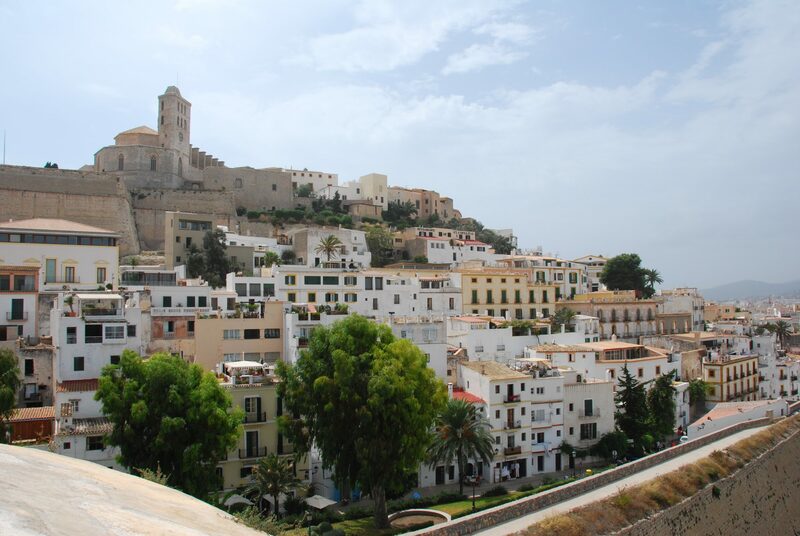 If you want to be able to return home with some chat about more than just the nightspots, Ibiza Town is a great place for culture, particularly around the Old Town, a historic area of the city that also has fantastic views across the bay. ‘Dalt Vila’ as it’s also known, is full of winding, cobbled streets, secluded stone courtyards and private chapels, perfect for getting away from the music and noise of the some of the resorts. Although Ibiza Town may not be able to offer the same kind of beach action as some of the other resorts on the island, the capital has more than enough vibrancy to make up for the lack of a couple of hundred metres of sand. Plus, on an island as small as Ibiza, you’re never far from some golden sands and it is easy enough to catch a ferry from Ibiza Town to any number of nearby beaches or walk to nearby beaches like Talamanca. The marina at Ibiza Town is a great spot for a little snooping as you’ll find some of the most luxurious yachts in the world moored up at the Marina Botafoch and Ibiza Nueva, where the Balearic jet set descend on Ibiza Town each summer to take advantage of the electric atmosphere and the opportunities to party. Hotels and apartments in Ibiza Town are extremely popular and can get booked up fast so it’s a good idea to get in there early before the season’s bookings really get under way (see all our hotels in Ibiza Town). Accommodation options are many and varied, with everything from the Miami inspired, €300 a night Hotel Ocean Drive 300 metres from Talamanca beach, to €90 a night Hotel Figueretas that is right on the seafront of Figueretas Beach and a 15 minute walk from the Old Town. As far as eating out goes, Ibiza Town might be a little pricier than neighoubouring resorts but is one of the best options on the island, with a huge selection of restaurants catering to every possible taste. Restaurants in the Old Town have a typical Spanish feel and are great for a romantic evening out, whilst the eateries down by the port area offer a stylish menu and the chance to take in the club parades with their drunken, barely clothed models, from the comfort of your table. Sa Penya, the old fisherman’s quarter is known for the ambiance provided by its narrow cobbled streets that are lined with restaurants and bars and frequented by the beautiful people of the island and if you really want to splash out, head down to the restaurants at Marina Botafoch and enjoy your dinner within spitting distance of a millionaire’s yacht. Although Ibiza Town doesn’t have its own official beach, you only have to travel a short distance to reach a sandy shoreline. The nearest beaches to Ibiza Town include the beautiful, sandy Talamanca Beach and Figueretas Beach, both of which are only a 15 minute walk from the town centre. The golden sands of Playa D’en Bossa Beach are also close by, but probably best reached by taking a bus from Ibiza Town to Playa D’en Bossa. It only takes 10 minutes! Despite the appeal of Ibiza Town by day, it is for the incredible nightlife that the town is best known. There are bars of every size and inclination, catering to every single crowd, from gay to straight and everything in between. It would be hard to come to this buzzy town and not be able to find the right spot in which to enjoy a drink and have a laugh. There are quieter bars you can find up the cobbled streets, or crowded watering holes serving luminous cocktails and big bassy beats that get going as soon as the sun goes down and don’t stop until it comes up again. And then there’s the clubbing. Noise restrictions in Ibiza Town mean that music isn’t meant to be audible after midnight so many of the clubs and bars within the town close their doors or lower the music at that time but that doesn’t mean there aren’t other options. Pacha is the best-known clubs in the capital and only a 15-minute walk from the port area. Both open their doors around midnight, with things really getting moving about 2am. Although Ibiza Town has the reputation of the ‘It’ spot in Ibiza, it does have the disadvantage of no immediate beach access, which is worth bearing in mind if you are a tanning addict. The demand for hotel rooms and the popularity of the bars and restaurants also means the streets can be overcrowded, queues long and of course the prices get hiked up too. An option that many holidaymakers often take is to stay in nearby resorts and bus or boat in to Ibiza Town as and when they want to.